"NASA's Solar Dynamics Observatory will provide a powerful new set of eyes, ears and magnetic sensors to better understand how the changing sun can disrupt our high-tech existence," said Madhulika Guhathukarta, lead scientist for the Living With a Star program, which seeks to study the link between the sun and Earth. The satellite's three instruments will take rapid-fire images of the sun, peer into the solar interior and measure its extreme ultraviolet radiation output. "It will observe the sun faster, deeper and in greater detail than any previous observatories, breaking barriers of space, time and clarity that have long blocked progress in solar physics," Guhathukarta said. SDO will return gargantuan volumes of data during its mission, beaming the information to dedicated antennas at White Sands, N.M. The sensors will send up to 150 million bits of data per second, almost 50 times more science data than any other mission in NASA history. "SDO will observe the sun almost continuously for more than five years, sending back data at an astounding rate of one-and-a-half terabytes per day," said Elizabeth Citrin, the mission's project manager. "That's almost 500,000 music downloads per day. With this wealth of data, we will learn how solar activity is created and how it will affect space weather. And space weather is what affects us humans here on Earth, our satellites, communications, [and] power grids." SDO will study the sun for at least five years, and managers hope the satellite will last a decade. Taking advantage of a lull in brisk ground winds, the 191-foot-tall Atlas 5 booster ignited its Russian-made engine and majestically lifted off from Complex 41 at Cape Canaveral at 10:23 a.m. EST (1523 GMT). NASA tried launching Wednesday morning, but persistent winds in Central Florida thwarted those plans. Burning a mix of kerosene and liquid oxygen, the rocket thundered to the fringes of space and accelerated to more than 11,000 mph in just four minutes. The first stage next shut down and backed away, and the Centaur upper stage fired its hydrogen-fueled engine for 11 minutes to reach a temporary parking orbit. After an 87-minute coast through space, the Centaur ignited again to propel the 6,800-pound satellite to a transfer orbit with a high point of 21,945 miles, a low point of 1,552 miles and an inclination of 28.5 degrees. 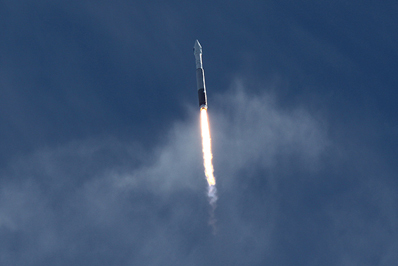 The Atlas 5 deployed SDO at 12:11 p.m. EST (1711 GMT) as the spacecraft flew over the Pacific Ocean. 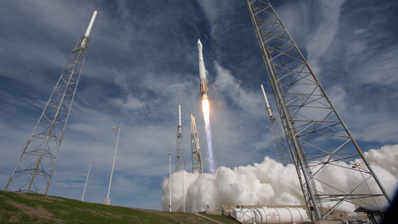 "The Atlas and Centaur were flawless," said Omar Baez, NASA's launch director for the mission. "They got us to where the satellite needed to go." NASA confirmed the satellite deployed its two electricity-producing solar paddles soon after separation, beginning two months of orbit-raising, testing and commissioning before the observatory begins normal operations. "All the right things that they wanted to do in those crucial first few minutes has happened like clockwork," Baez said. Six main engine burns and a handful of trim cleanup maneuvers are on tap over the next three weeks to raise SDO's altitude to a circular orbit more than 22,000 miles above Earth. SDO will also unfurl two Ka-band high-gain antennas about six hours into the mission. The observatory's instruments will open their doors after it reaches a circular geosynchronous orbit, according to Citrin. "The activities are interspersed, but basically the first month is spacecraft checkout and getting on orbit, second month is instrument checkout and the third month data's coming back," Citrin said. The satellite will be stationed in an unusual inclined geosynchronous orbit, and SDO will appear to hover in a figure-eight pattern oscillating about 28.5 degrees on both sides of the equator. The probe will remain in constant view over the White Sands ground station throughout its mission. Officials selected the orbit to maximize SDO's data return and minimize the time the satellite will spend in Earth's shadow, when the sun would be blocked from view. "Because we have so much data, we don't have an on-board recorder," Citrin said. "There is no recorder that can handle this volume of data, so we have to send our data directly down to the ground." Scientists will provide near-live data to researchers and the public on the Internet. Imagery from SOHO, an SDO predecessor, is also available online. But SDO will snap pictures at a higher rate and with better resolution than any sun-watching probe before. 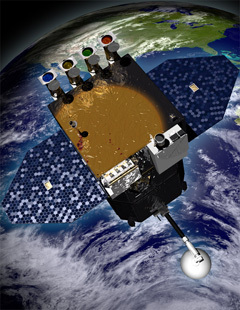 The satellite will record images every second with 10 times greater resolution than high-definition television. The objective of the mission is to better understand the relationship between the sun and Earth, especially as society relies more on high-tech gadgets in everyday life. "Modern society is so dependent on satellite information that any variability caused by the sun has an impact. Solar variability can affect human spaceflight, satellite operations, smart power grids, GPS navigation, emergency radio communications, air travel, and financial services," Guhathukarta said. The holy grail for space weather researchers is to refine forecast models predicting the impacts of streams of plasma coming from the sun during violent solar storms. "One of the goals for SDO is to say if solar activity is predictable, we should learn how to do it and try to develop the tools to do it," said Phil Scherrer, principal investigator for the Helioseismic and Magnetic Imager from Stanford University. "There are two questions. One is if it's predictable and the second one is what are the tools to do the forecasting." The charged particles are propelled away from the sun at more than a million miles per hour, and when the magnetic fields of the sun and Earth are aligned just right, the radiation can propogate at the north and south poles. These events, which originate in solar flares or coronal mass ejections, trigger costly consequences spanning the globe. A solar storm in March 1989 knocked out power to six million residents in Quebec, and an influx of radiation in October 2003 disrupted GPS navigation signals as far south as Florida, according to SDO officials. Solar activity is expected to increase in the next few years. An 11-year cycle governs the prevalence of solar storms, during which the sun alternates between relatively quiet and violent periods. The sun is currently in an unexpected extended solar minimum, but scientists say they are seeing an increase in sunspots, a sign that solar activity may be on the rise. SDO's launch was delayed more than a year because of a cramped Atlas 5 rocket manifest, but solar activity remained low longer than predicted. "We very much wanted to start observing with SDO near minimum so we could watch the rise of activity," Scherrer said. "We were a little late getting up in the sky, but the sun's very cooperative." The solar storms are powered by the sun's ever-changing magnetic field. 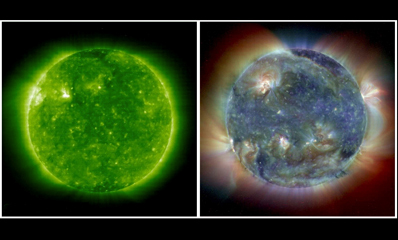 "Every time we look at the magnetic field of the sun, it's different," said Dean Pesnell, SDO project scientist. "We would like to study that magnetic field from its creation inside the sun, to coming out through the surface, and its eventual destruction above the surface of the sun." SDO carries a a Helioseismic and Magnetic Imager that will investigate the interior source of the solar magnetic field, a bank of telescopes called the Atmospheric Imaging Assembly to take high-resolution snapshots of the sun's surface, and the Extreme Ultraviolet Variability Experiment to take the pulse of the sun's radiation output. The instruments will track developing solar storms from their genesis in the sun's dynamo to their violent climax. "The variability of the sun is predominately caused by magnetic fields, so if we want to be able to predict that variability, we have to start with predicting the magnetic fields," Scherrer said. HMI will use rapid-cadence magnetic field measurements at the sun's surface to study the motion of materials deep inside the solar interior. The imager will offer improvements over a doppler sensor on SOHO. "The goal is to understand the relationship between the internal dynamics and magnetic activity," Scherrer said. "With HMI, we can measure the structure, the flows and the dynamics in the interior of the sun, and we can measure the magnetic field at the surface." HMI will also measure the direction of the magnetic field, helping scientists determine when solar flares and coronal mass ejections are more likely to affect Earth. The AIA instrument package features four prominent turret-like telescopes bolted to the top of the spacecraft to gather images of the sun in a wide swath of temperatures ranging from 6,000 Kelvin to 1.5 million Kelvin. The sweltering temperatures measured by AIA are equivalent to between 10,340 degrees and 2.7 million degrees Fahrenheit. "On the Earth, we have these things called earthquakes," said Alan Title, AIA chief scientist at the Lockheed Martin Solar Astrophysics Laboratory. "Earthquakes occur on tectonic plates. That's where big masses of the Earth move across each other and create shears, and these plates break and release a lot of energy. On the sun, the magnetic fields are the logical equivalent of tectonic plates. And as they move and create shear, they have the potential of releasing huge amounts of energy." The AIA telescopes will take a set of pictures every 10 seconds, creating images four times the size of a single HDTV frame. Scientists must use specially-outfitted monitors to see the pictures, according to Title. "We will be able to go in and blow up regions of the sun and look at very high time detail and spatial detail," Pesnell said. NASA currently uses the TRACE spacecraft for up close looks at the sun, but AIA will provide improved resolution and observe the entire solar disk, instead of smaller sections. The EVE ultraviolet sensor will monitor the brightness of the sun and measure fluctuations in its radiation output. "The extreme ultraviolet radiation is extremely energetic. It's much more energetic than the photons that we call the near-ultraviolet that reach the ground and cause sunburns," said Tom Woods, EVE principal investigator at the University of Colorado's Laboratory for Atmospheric and Space Physics. Extreme ultraviolet waves are absorbed by the atmosphere before reaching Earth's surface, but the radiation can wreak havoc with radio communications and GPS satellite navigation signals. Woods said data from SDO will be fed into NOAA and Air Force operational space weather forecast models.